BRIDGETOWN, Barbados, Jul 27 2017 (IPS) - With wind, solar and other renewable energy sources steadily increasing their share in energy consumption across the Caribbean, Barbados is taking steps to further reduce the need for CO2-emitting fossil fuel energy. The tiny Caribbean island is rolling out a project to reduce both electricity consumption and greenhouse gas emissions while driving down government’s fuel import bill. In addition to changing out the street lights and retrofitting the 13 government buildings, the project will also see the use of more electric vehicles in Barbados. The country is hoping to save up to 3 million dollars in electricity bills annually with the implementation of a 24.6-million-dollar Public Sector Smart Energy Programme (PSPP). The project, which is being funded by the Inter-American Development Bank (IDB) and the European Union (EU), includes changing out close to 30,000 street lights across the country, replacing them with Light Emitting Diode (LED) fixtures. “So, this project will save us a couple million dollars a year, [up to] 3 million a year. It is a small amount in the context of Barbados but it is a start to save some money,” Minister with responsibility for Energy Darcy Boyce said, while explaining that based on a 2009 study, government is aiming for a 29 percent per year reduction in electricity consumption through various methods of renewable energy use and energy efficiency. Boyce acknowledged that government is a significant user of electricity, adding that the street lamps account for a great portion of that usage. Renewables have become a major contributor to the energy transition occurring in many parts of the world and the growth in renewables continues to bolster climate change mitigation. In December 2013, Barbados passed the Electric Light and Power Act (ELPA) in parliament and later amended it in April 2015. It replaced the original 116-year-old Electric Light and Power Act which was passed in 1899. The ELPA revised the law relating to the supply and use of electricity and promotes the generation of electricity from sources of renewable energy, to enhance the security and reliability of the supply of electricity and to provide for related matters. A key aim of the government in passing the Act was reducing the Bds$800 million fuel import bill (50 percent of which is used to generate electricity). It also intended to promote the generation of electricity from renewable energy sources and allows independent power producers to supply electricity in addition to the Barbados Light and Power Company (BL&P). 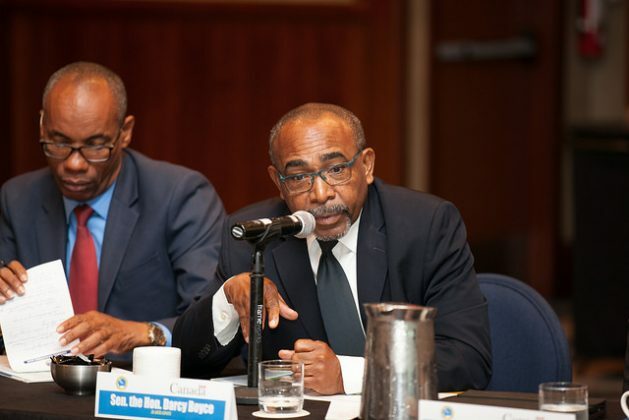 Boyce urged those involved in the PSPP to “keep the momentum going”, adding that it was his intention for Barbados to reach 100 percent reliance on renewable energy by 2045 as outlined in the BL&P 100/100 Vision. “The Light & Power has reached to a wonderful point where they are committing to have 100 percent renewable energy within 30 years. I pressed them and I wanted them there by 2035 but they say no, 2045 and I will live with 2045,” Boyce said. The shift towards renewables is driving down greenhouse gas emissions from electricity generation, buildings’ heating and cooling, and transport. So far government has two electric vehicles as part of a pilot project and is expected to procure about six more by the end of this year. Head of the Green Economy and Resilience Section of the EU Peter Sturesson urged officials to go even further to focus on energy efficiency, pointing out that this is an important aspect if the country is to save critical foreign exchange. “As you know, the European Union remains committed to support renewable energy, energy efficiency and sustainable development in Barbados and in the Caribbean region,” Sturesson said. Sturesson pointed out that the project marked “yet another milestone” in Barbados’ development. While the Barbados government leads the renewables drive, everyone on the island is catching on. In addition to the solar panels and water heaters which can be seen on government buildings, hospitals, police stations and bus shelters, thousands of private homes also have them installed. And desalinization plants are installing large photovoltaic arrays to help defray their own electricity costs. The combination of the ever-escalating and volatile price of oil, and the cost of importation, place Barbados and other island nations in the unenviable position of having the highest electricity prices in the world. The effective cost of electricity in Barbados is around $0.65/kWh. This rate varies slightly from residential to commercial power users. Roughly 60 percent of the bill is simply a fuel charge. This component, the Fuel Clause Adjustment (FCA), varies month to month but has been increasing at a normalized rate of 3.7 percent per year over the past seven years. Representative of the IDB Juan Carlos De La Hoz Viñas said there are many benefits to be derived by reducing the cost of electricity in the country. “We all know and it’s part of the day to day conversation with the private sector that electricity costs are a major hurdle in terms of doing business in the country. So every attempt to reduce the electricity cost is a path to a greater competitiveness in the country,” he said.